I decided to make homemade bagels. I'm honestly not sure where I even get these ideas sometimes. But once I decide to do something, I'm probably going to do it. It's only a matter of when. So last weekend, I bought everything I'd need to not only make bagels, but have a full, New York City-style bagel spread, complete with smoked salmon and all the fixings. At this point, I decided to stick with one of my New Year's resolutions of hosting more parties. So I decided to make bagels from scratch and have some friends over for a day-after New Year's Day Brunch. Actually making the bagels was a really fun experience. I almost felt like I was doing some kind of science project--I had no idea if the bagels would actually come out like bagels. But, I had a backup plan. 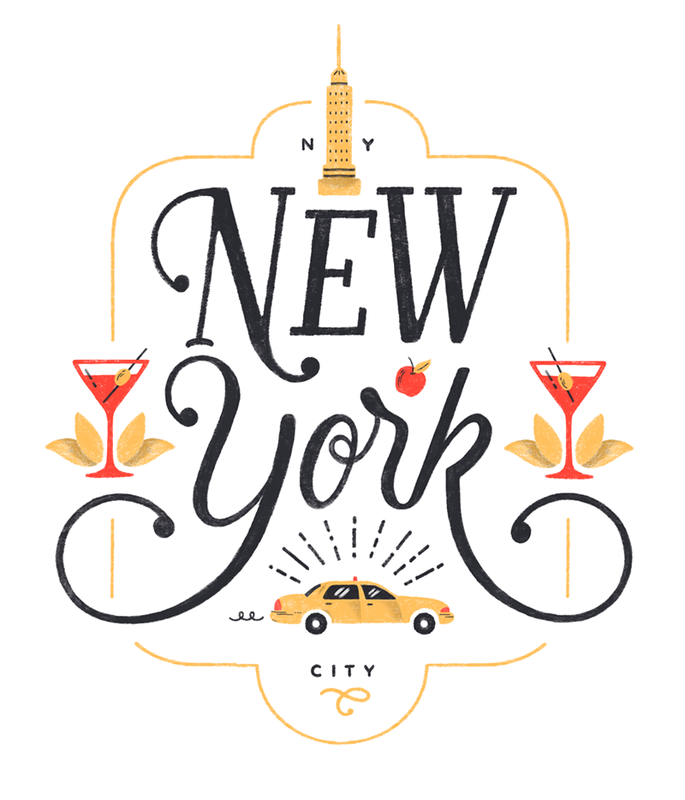 If the bagels were a flop, I'd just go to one of my favorite NYC bagel places and pick some up. Transforming my 350-sq foot studio into a place where I could host 8 people was actually more work than making the bagels. Everything that could be stacked or tucked away was staked and tucked away. And miraculously, it seemed as though everyone would fit. But back to the bagels. The great thing about bagels compared to other yeast-rising breads is that this recipe actually calls for relatively short dough-rising times. This allowed me to start them around 7:30 am and be completely finished just a couple of hours later. Once you make the dough, it only takes about 30 minutes for the dough to rise before you're on to the next part--shaping the dough into bagel rings, which are then boiled one minute per side. The second "rise" is also relatively short--just 10 minutes. Then, into the oven they go! One notable difference, however, is that the bagels will continue to cook once you remove them from the oven, so you do need to wait about half an hour. After the dough rises, divide it into 12 equal parts. Roll each part into a 9-inch log. Then, form into a ring by pressing the ends together. 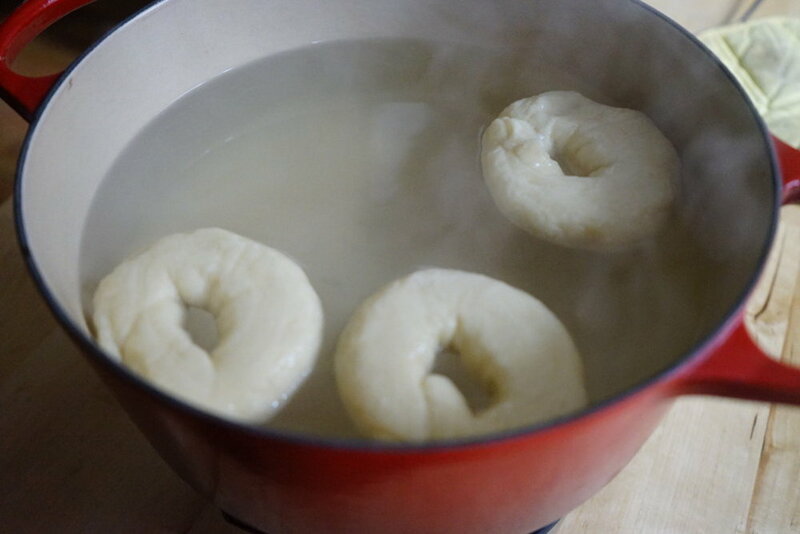 Boil the bagels, 3 at a time, so they have plenty of room to bob around. Boil one minute per side. Place the bagels on a cooling rack so that the excess water can run off. 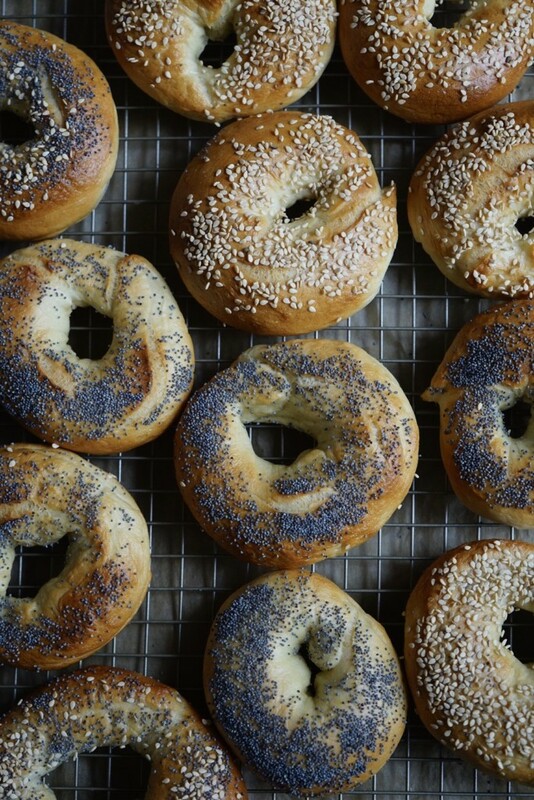 Lightly brush the bagels with water, then sprinkle with sesame seeds or poppy seeds. Transfer the bagels to a parchment-lined baking sheet and allow to rest, covered with a damp dish towel, for 10 minutes. Bake until golden on both sides. Remove from the oven and allow to cool. Slice and toast before serving! *The water must be warm, but not too warm, to activate the yeast. Dissolve the yeast in the water. Set aside (for about 5 minutes) while you prepare the rest of the dough. In the bowl of a stand mixer, combine the bread flour, honey, salt and sugar. Attach the dough hook. Add the yeast-water. Mix on low for two minutes. The dough should appear shredded. Increase the speed to medium low and mix for an additional 8-10 minutes. If the dough separates into two balls of dough while mixing, stop the mixer and push the dough down. Then, restart the mixer. This will ensure that all of the dough is being kneaded. The dough should be dry to the touch and stiff. Turn off the mixer. Remove the bowl. Shape the dough into a ball and return to the bowl. Cover the bowl with a dish towel that has been dampened with warm water, and squeezed dry. Let the dough rise in a warm, draft-free place for about 30 minutes. The dough will not double in size like other bread recipes, however, if you poke it, it should spring back. Preheat the oven to 425 F. Fill a large, shallow pot with 4 quarts of water (a dutch oven works perfectly for this). Bring the water to a boil, then reduce the temperature so that it's at a hearty simmer. Divide the dough into 12 parts. Work fairly quickly to prevent the dough from drying out. Roll each piece into a 9-inch log. Then, form the log into a ring, overlapping the ends and pinching them together, leaving a hole about the size of a quarter. Set each formed bagel on the baking sheet. Once they are formed, cover with the damp dish towel and let rise for an additional 10 minutes. Prepare a second baking sheet. Place a cooling rack on top of the second baking sheet. Boil the bagels. Transfer the bagels, three at a time, to the simmering water. Cook on each side for 30 seconds-1 minute (The longer you cook at this point, the less they'll rise in the oven. Closer to 30 seconds is preferred). The bagels should appear somewhat shriveled. Next, remove the bagels and place them on the baking sheet with the cooling rack so that the water can drip off. Adjust the heat if necessary to keep the water warm enough. 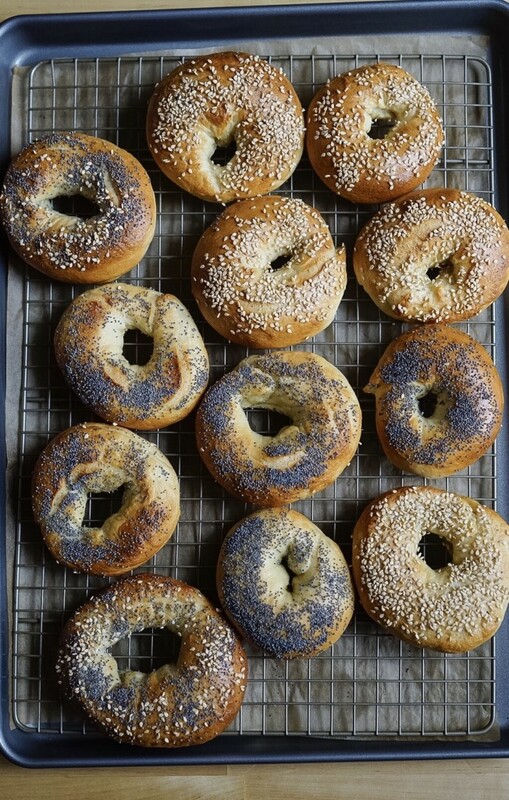 Once all of the bagels have been boiled, brush them lightly with water and sprinkle on the sesame and/or poppy seeds. 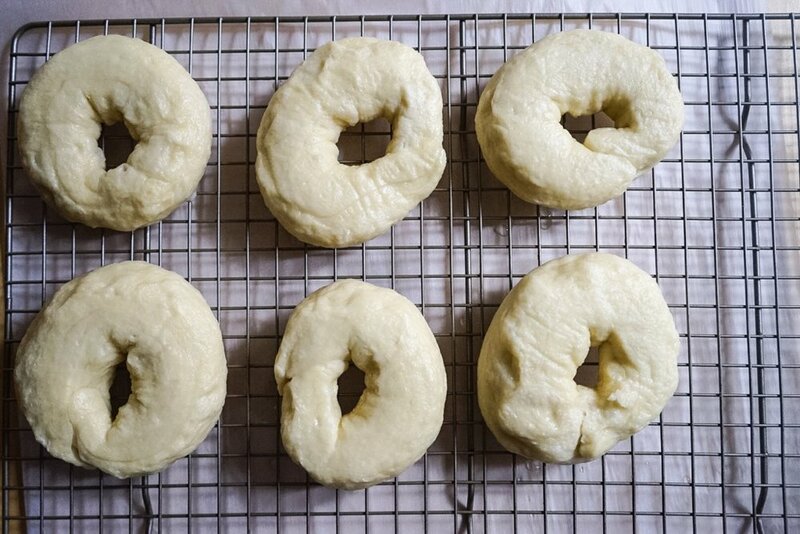 Then, transfer the bagels back to the parchment-lined baking sheet, about one inch apart. Bake the bagels in the top third of the oven, at 425 F oven for 15 minutes. Rotate the pan and bake an additional 10 minutes. (*Check sooner to make sure the bottoms of the bagels aren't burning.) The bagels should be amber on both sides and have formed a crust on each side. Remove from the oven and transfer to a cooling rack for 30 minutes to allow the interior to finish cooking. When ready to serve, slice and toast. This recipe was adapted from Chowhound.